Historical Maps The Historical Maps program is devoted to developing skills of working with historical maps. Here, pupils will learn how to distinguish between geographical and historical maps; they will learn of different kinds of historical maps and be able to use them in order to tell about past events. Lecture "How to Show on the Map"
Training "Make a map of an early man"
The hero of this program is the Globe who will strictly monitor pupils' success in acquiring knowledge and coping with assignments. 3. "Traveling with a Map" is a small section for those who need clarification of the following concepts: globe, scale, cardinal directions and continents. This information leads to understanding the difference between a geographical and an historical map. The second and third sections can be used as additional material for explanation, depending on pupils' age and academic background. 5. 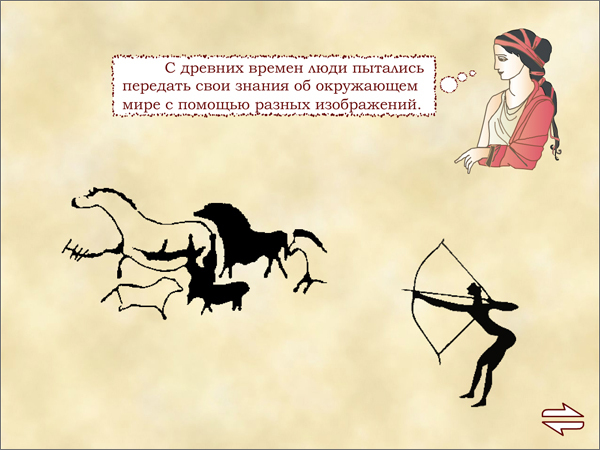 "Read a Map of an Early Man" is a training assignment for knowledge consolidation. 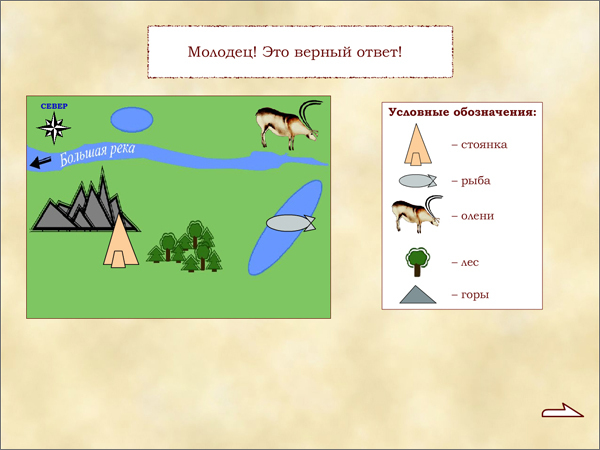 The essence of this training is to help an early man to make a map using ancient conventional symbols. The superb quality of visual materials allows for effective application of program materials as visual aids for frontal class work. Using an interactive whiteboard may help to expand the teacher's facilities when working with the class.